SJ Social Media plugin works with classes and it allows users directly share their posts on Facebook, Twitter. This guide will help you install SJ Social Media step by step. 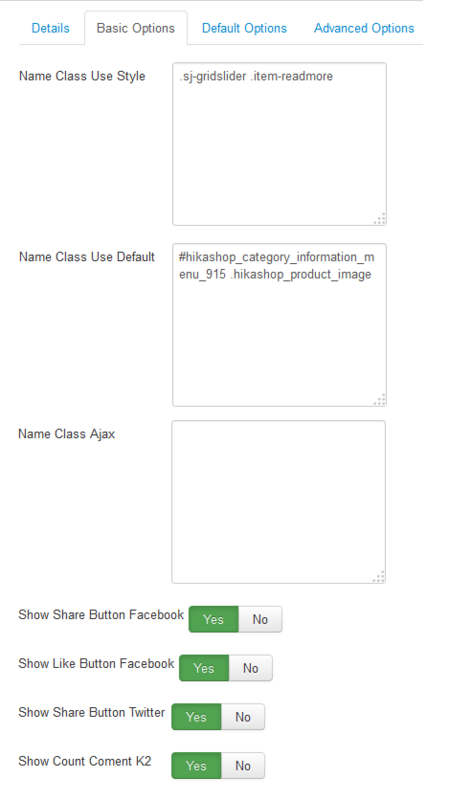 Name Class Use Style – Allow to input class, the Facebook & Twitter icons will use the specific styles. And Mutiple module: the string seperated by character “,”. Name Class Use Default – Allow to input class, the Facebook & Twitter icons will use the default styles. And Mutiple module: the string seperated by character “,”. Name Class Ajax – Allow to input class of module use Ajax. Parent classes act on the whole module(ID or Class). Example: .sj-gridslider or #hikashop_category_information_menu_915. Children classes hold the article’s link(title, readmore, image). Example: .item_readmore, .hikashop_product_image. Show Share Button Facebook – Allow to show share button of Facebook or Not. Show Like Button Facebook – Allow to show like button of Facebook or Not. Show Share Button Twitter – Allow to show share button of Twitter or Not. Show Count Comment K2 – Allow to show the number of K2 comment or Not. Show In Parent Class – Allow to show icon of Facebook & Twitter in parent class or Not. Chosen Type Share Button Facebook – Allow to choose Facebook share button type. We support 6 button styles. Chosen Type Like Button Facebook – Allow to choose type like button Facebook. We support 4 button styles. Chosen Type Share Button Twitter – Allow to choose Twitter share button type. We support 3 button styles.